Redman is landing page HTML5 Template and blog page. It can be used for creative photographer to show portfolio and skill. Its build based on twitter bootstrap v.3.0, so it has powerful features. 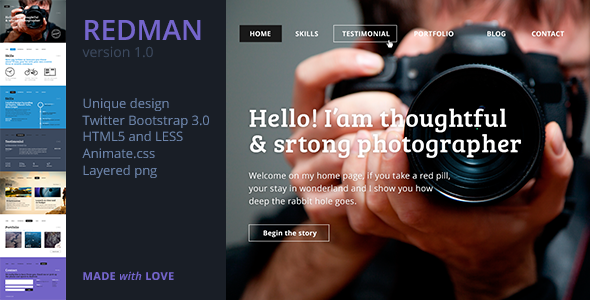 Item Reviewed: Redman Landing Page HTML5 Template (Creative Photographer) 9 out of 10 based on 10 ratings. 9 user reviews.